LVM(Logical Volume Manager)是一種可以動態變更 volume (由 LVM 所切割出來的空間被稱為 volume)大小的方式,可以讓你能更容易利用管理你的硬碟.傳統的硬碟空間在切割完時就決定了大小,如果要重新規劃必須將資料先備份下來,硬碟磁區重 新切割才可能有改變原來的硬碟磁區環境.不過 LVM(Logical Volume Manager) 就不同了,如果磁區空間不夠了,你可以隨意將空間放大或是磁區的使用率太低也可以將空間縮小.當我們在放大縮小時這都不影響原先在硬碟上的資料,聽起來很 神奇吧!! A physical volume is typically a hard disk, though it may well just be a device that ‘looks’ like a hard disk (eg. a software raid device). 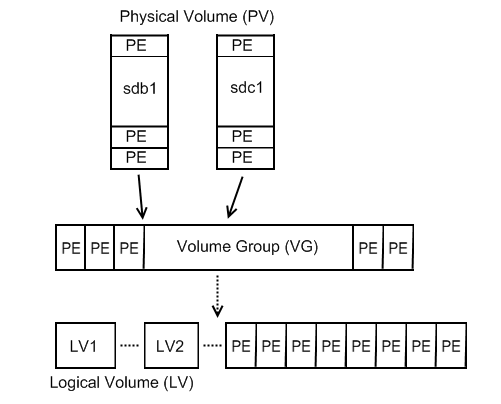 The Volume Group is the highest level abstraction used within the LVM. It gathers together a collection of Logical Volumes and Physical Volumes into one administrative unit. 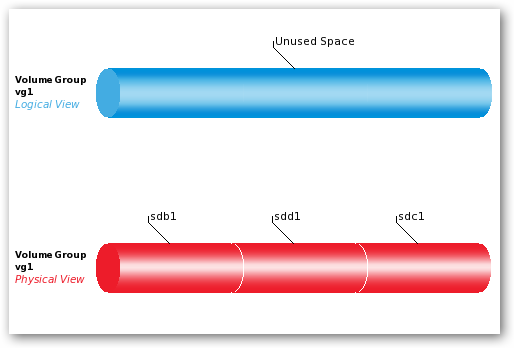 The equivalent of a disk partition in a non-LVM system. 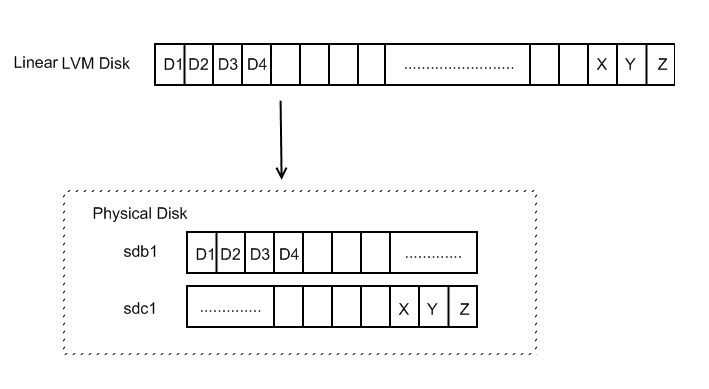 The LV is visible as a standard block device; as such the LV can contain a file system (eg. /home). Each physical volume is divided chunks of data, known as physical extents, these extents have the same size as the logical extents for the volume group. 整個架構就是將許多的 partition(/dev/sdb1 /dev/sdc1) 組成一個虛擬的磁碟(/dev/vg).之後就可以將它動態切割成你需要大小的 partition(/dev/vg/lv1,/dev/vg/lv2).就可以像一般的 partition 來使用. 如果沒有那請自己編譯一個含有上敘功能的模組吧! !這些功能在編譯核心選項中的 Multi-device support (RAID and LVM) 下的 Logical volume manager(LVM) support 可以找到. 如果你的 “/ (root)” 是掛在 LVM 下請確定你的 LVM 是編譯在核心下的,如果是編譯模組也沒關係,請重做你的 initrd . note: 除了 boot 外其他的檔案系統能掛在 LVM 上. 因為 /etc/lvmtab 一開始並不存在所以我們會先用 “#vgscan” 來自己建立. LVM 提供了三種硬碟對應( mapping )方式,1.Linear 2.Mirrored 3.Striped 預設是 Linear 如果系統只有單獨一個 PV(Physical Volume) 時的唯一選擇.當你系統 VG(Volume Group) 是由多個 PV(Physical Volume) 時就可以使用另外兩種 2.Mirrored 3.Striped 他們跟 RAID 的概念一致,你可以把它想像成 Soft RAID 的 方式.Mirrored 就像是 RAID 1 ,Striped 就像是 RAID 0. 我的環境是利用兩個硬碟 sdb1,sdc1組合成一個 Linear LVM Disk,資料的讀寫時系統會依序下去,當 sdb1 空間用完時才會寫到 sdc1 的硬碟裡面. 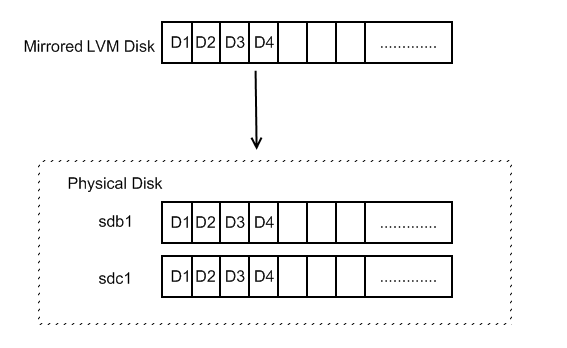 我的環境是利用兩個硬碟 sdb1,sdc1組合成一個 Mirrored LVM Disk,當資料的讀寫時系統會同時在 sdb1 sdc1 都寫入相同的資料.這就像是 RAID 1.適用於當資料不能遺失的重要資料. 我的環境是利用兩個硬碟 sdb1,sdc1組合成一個 Striped LVM Disk,當資料的讀寫時系統會依序sdb1 ,sdc1 交錯寫入.這就像是 RAID 0.因為資料是交錯的寫入所以在讀寫時可以快速從不同硬碟讀到所需的資料.也因此適用於當負載比較重的資料儲存庫. The filesystem on /dev/vg1/LVOL1 is now 6553600 blocks long. 如果你的 VG 已經沒有空間,則剛剛的方法也無用武之地,所以現在要將 VG 加大.請建立 1 個 partition ,最重要的是要將他的 type 改成 8e(LVM 磁區型態代號),我們還需要將剛剛建立的 partition 做 LVM 的初始化. 前面介紹 LV Properties 時說到 LVM 提供了三種硬碟對應( mapping )方式,1.Linear 2.Mirrored 3.Striped 預設是 Linear 剛剛前面的範例都是使用 Linear ,如果系統只有單獨一個 PV(Physical Volume) 時的唯一選擇.當你系統 VG(Volume Group) 是由多個PV(Physical Volume) 時就可以使用另外兩種 2.Mirrored 3.Striped 他們跟 RAID 的概念一致,你可以把它想像成 Soft RAID 的 方式.Mirrored 就像是 RAID 1 ,Striped 就像是 RAID 0. Striped(RAID 0) 最少需要 2 個 PV(Physical Volume) 存在 VG(Volume Group) 中,這邊有三顆 PV(Physical Volume) 我通通都把他指定下去,下面可以看到 LV(Logical Volume) 真正對應到實體 PV(Physical Volume) 的狀態. note:系統會將 striped 建立成 striped 模式,如同上面的舉例,-i 3 那 3 筆資料是分散在那 3 個磁碟(/dev/sdb1 , /dev/sdc1, /dev/sdd1)之內的.-I 則是 stripesize 大小為(2的n次方,n=2 to 9). note:系統會將 mirrored 建立成 mirrored 模式,–corelog 需要另外一顆 PV(Physical Volume) 存放 Mirrored Log,當有這個 Log 的時候系統會在每次重新開機都會先同步 mirror 的資料. 什麼是 snapshot ,基本上 snapshot 照字面的意思是快照,就如同它的意思它幫我們的 LV(Logical Volume) 照相.它可以幫 LV(Logical Volume) 記錄下當時 LV(Logical Volume) 的資料,但是它不是做備份,snapshot 採用的方式叫做寫時複寫(copy on write),當 LV(logical Volume) 產生一個 snapshot 時.LV(Logical Volume) 和 snapshot 同時都是指向同一筆資料,一開始 LV(Logical Volume) 和 snapshot 都是指向同一個區塊的資料,所以 snapshot 一開始自己磁區是空的.只有當 LV(Logical Volume) 的資料備有寫入會是修改時,才會將資料原始資料複製到 snapshot ,之後才將 LV(logical Volume) 的資料做寫入或是修改. <所以 snapshot 很適合用在資料庫備份先行將資料做 snapshot(快照),之後只要針對 snapshot 磁區做備份即可.原先的資料還是可以進行讀寫不會受到備份的影響,不需要在進行備份時還要將資料庫所在的目錄先行離線.LVM 1 sanpshot 只能夠唯讀不過在 LVM2 的 snapshot 就可以讀寫了. 在建立 snapshot LV(logical Volume) 時要與原先的資料處於在同一個 VG(Volume Group),建議空間為原資料 LV 大小的 15-20 %.假設我要備份上一個例子 /dev/vg1/striped 大小 15 GB的資料,那我要建立大小為 3G 的 snapshot 的空間.首先將你的資料夾掛載起來,最好先將 LV 掛載成 read only 的方式.以防止有人此時使用此 LV. lvcreate — INFO: using default snapshot chunk size of 64 KB for “/dev/vg1/sanpshot"
不要忘記將原先的 LV 恢復成 Read/Write 模式. 從剛才的步驟可以發現 snapshot 也是一個磁區 (partion) 但是一開始他並不佔有任何空間. snapshot 的作法是當原有的磁區 /dev/vg1/striped 資料有變動(新增,移除,變更)時,他會複製一份原始的檔案到 /dev/vg1/snapshot 磁區,然後才會讓更新的資料寫到原本的磁區.看一下下面的實驗吧!! 可以到無論是 /database 或是 /backup的資料都是一樣,現在移除 /database/a.test.file 檔案. 你還是可以發現檔案 a.test.file 還是存在於 /dev/vg1/snapshot 磁區.這時的 snapshot 也開始使用到磁區的空間了. 當我們移除 a.test.file 時,相對應的 inode 也跟著移除. 這時系統會將 a.test.fil 所在的 chunk(64KB) 標記成 ‘dirty’ 並將他複製一份到 ‘snapshot’ volume. 這邊要提的是 snapshot 並不是以檔案為單位,而是以 PE(chunks,blocks) 為標記單位.有一點要注意當 snapshot 的空間用完時,此時的 snapshot也失去作用(deactivated).